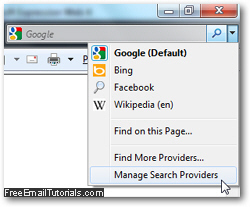 In the previous tutorial, we explained how you can add Facebook search to Internet Explorer; when you did, the Internet Explorer "Add Search Provider" dialog gave you the option of making Facebook the default search provider; if you haven't chosen to do so at the time, this is not a problem: as you'll learn in this tutorial, you can at any time change your web browser's default search provider. In this tutorial, we will show you how to make Facebook the default search engine for the Internet Explorer search box (IE 8 or IE 7). As soon as you do, Internet Explorer will open the "Manage Add-ons" dialog to let you add or remove search providers for the search box, and change your current default provider (what search engine will automatically be used when you launch a query from the web browser's search box, without manually picking another search provider). Make sure that "Search Providers" is selected on the left (it should automatically be). If you have already added Facebook search to Internet Explorer, you will see it listed on the right hand side, as is the case above (second search provider). Right-click on "Facebook" icon displayed in the right pane, and choose "Set As Default" from the context menu that opens; you can also left click on Facebook to select it, and then click on the "Set As Default" button displayed in the bottom right corner of the Manage Add-ons dialog - both approaches will yield the same result, and make Facebook the default search provider for the Internet Explorer search box. And this is all you need to do to make Facebook the default search engine in Internet Explorer! If you ever change your mind and decide to use another search provider as default, just follow the same steps outlined above, but this time right-click on another search engine to make it the default, and close the Manage Add-ons window. 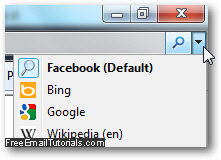 Internet Explorer Tip: unlike simply picking a search provider without adding it (as explained in the previous tutorial), this is a "persistent setting" - in other words, if you close Internet Explorer and restart it, it will not only keep Facebook inside the list of current search providers, but it will also remember that it is the default search.